Egyptians’ careful observations and profound knowledge of the natural world enabled them to identify certain animals with specific qualities that could symbolize certain divine functions and principles in a particularly pure and striking fashion. As such, certain animals were chosen as symbols for these particular aspects of divinity. When you say someone is loyal, the word ‘loyal’ is so vague. But if you say ‘loyal as a dog’, you leave no doubt about your intent. This is the power of animal analogy. 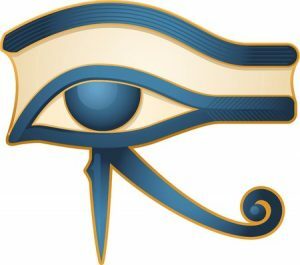 The animal or animal-headed neteru (gods, goddesses) were symbolic expressions of a deep spiritual understanding. When a total animal is presented in Ancient Egypt, it represents a particular function/attribute in its purest form. When an animal-headed figure is presented, it conveys that particular function/attribute in the human being. 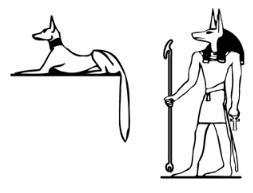 The two forms of Anubis, in the two illustrations shown here, clearly distinguishes these two aspects. This third form is the opposite of animal-headed human. In this case, we have a human-headed bird—that is the Ba—representing the body/soul hovering over the body. 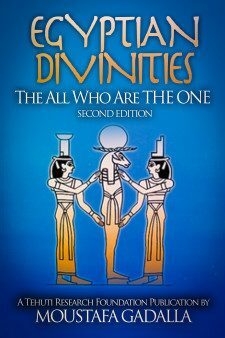 The depiction of the Ba, then, is the divine aspect of the terrestrial. The Ba is depicted as a stork. The stork is known for its migrating and homing instinct, and is also known worldwide as the bird that carries newborn babies to their new families. The stork returns to its own nest with consistent precision—hence, it is a migratory bird is the perfect choice to represent the soul.